Using reclaimed pieces of fabrics & beads and patchwork technique. Normally the mannequin is the bare holder of the garments. By embellishing this child mannequin Iwanted it to be considered as an object of art in itself and not just a functional object. Making unique a standardised dolls produced in mass production industry in China and reclaims it from the craft sector restoring her badge of honour. Rescued from the gutter, from rags to riches, the dolls become a Queen of Sabbath where unwanted material make her appearing all her glory. Inspired by Bayeux tapestry, story of feminism and attempts to feature everything a modern woman need and aspire in her personal, social, spiritual and professional life. 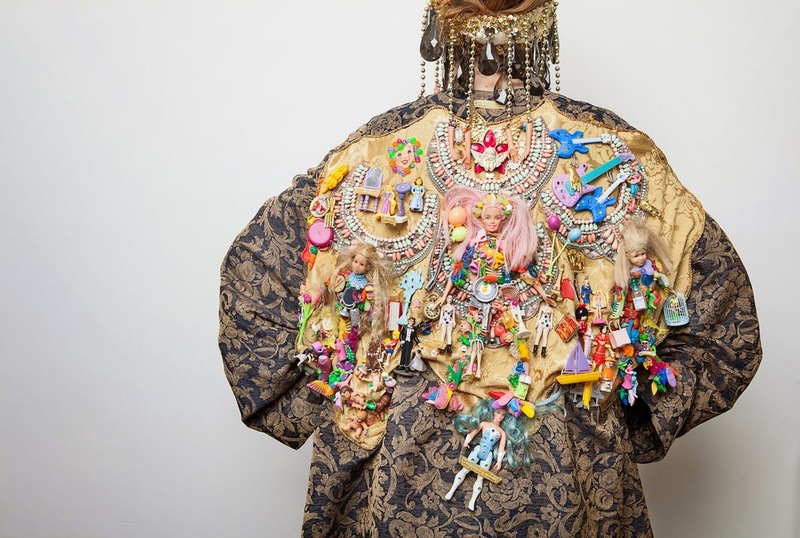 This garment is the result of two months of collecting, sourcing, skimming car boot sales and charity shop. I like to work with miniature objects as they allow me to recreate a little microcosm. This is a clock without dial that I found in the street. I replaced the missingclock dial by a baby dollfacethat I painted and adorned with hand-stitched beads. On this kitsch rococo style clock, all the heads of golden figurines have been chopped so I replaced them by mermaids and fairies one. In heaven, time has stopped on tea time andUrsuala/shiva dressed a drag queen is the goddess of ice-cream. The Death is welcoming the dead with her two Shrek bodyguards among the pantheon of Disney celebrities dancing on the "Dance Macabre" of Camille Saint Saëns for a psychedelic Sabbath in an apocalyptical and psychedeliciconoclast & syncretic vision inspired by Bosh painting. In heaven, time has stopped on tea time andUrsuala/shiva is the goddess of ice-cream. The Death is welcoming the dead with her two Shrek bodyguards among the pantheon of Disney celebritiescovered in glitters dancing on the "Dance Macabre" of Camille Saint Saëns for a psychedelic Sabbath. This kawaii neckpiece "cute" in japanese defines a sweet aesthetic ofpastel colours. It allows the adult to find again the wonderful innocence of childhood in a society where the entrance in professional world is always more and more harder. The kawaii sensitivity, merely aesthetic, non committed and depoliticised relies a image of women of weakness and devoid of responsibilities. Presented as a breastplate that could refer to a warrior jerkin. This piece question the ambivalent status of this kawaii amazon , between strength and vulnerability. This dress is made from scraps of multicolours leather reclaimed from the fashion designer Martina Spetlova" on the theme of "studio's discarded" (I already made a dress about unwanted paintings from an painter studio, see article here) because in nature, nothing get lost, and everything is created by transformation. Original shapes from the scars haven't been redrawn or cut again. They contains in hollow, in negative the shape of the patterns and designs they contributed. Reclaimed, this pieces of leathers evaluated unusable by their size or shape, despite their rare and noble material, become part of parcel of a new and original piece of work. It is in their reject and uselessness that dwells their fragile beauty. The scraps of leather on the ground reveal the creative process based on the instinctive assemblage of shapes and colours, playing on the unfinished character of a piece always in motion. Placed at the entrance of the gallery, they establish the new conventions of the surrealistic world you are about to enter abolishing scientific laws like gravity or blurring lines between perception of horizontal and vertical, creating a suspension of disbelief pact. The kimono is pined on the wall in order to divert its function of "things to wear" literally "kiru" and mono" in japanese and to convey a status of tapestry which, like the one of Bayeux, tells the great warrior epics of Middle Age. 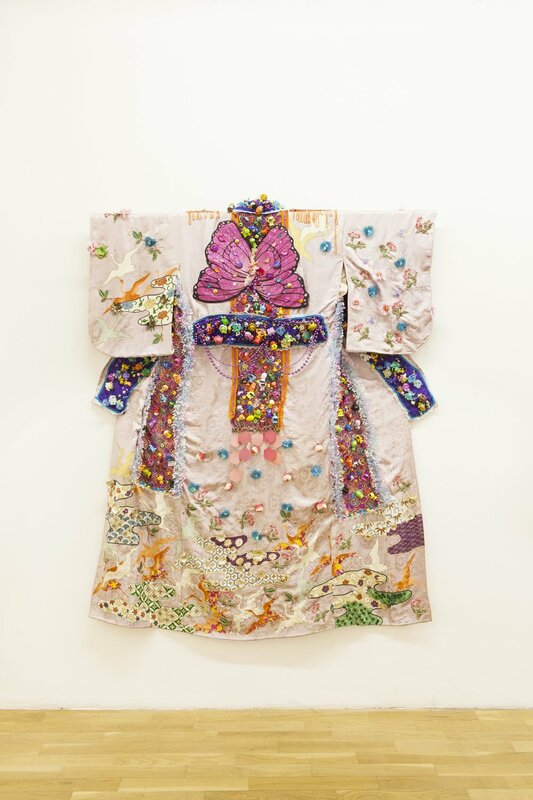 "Textile painting" this kimono become a narrative outfit that tells a story, full of revisited symbol,s like in traditional japanese culture where it defines social or marital status of the one that wear it. 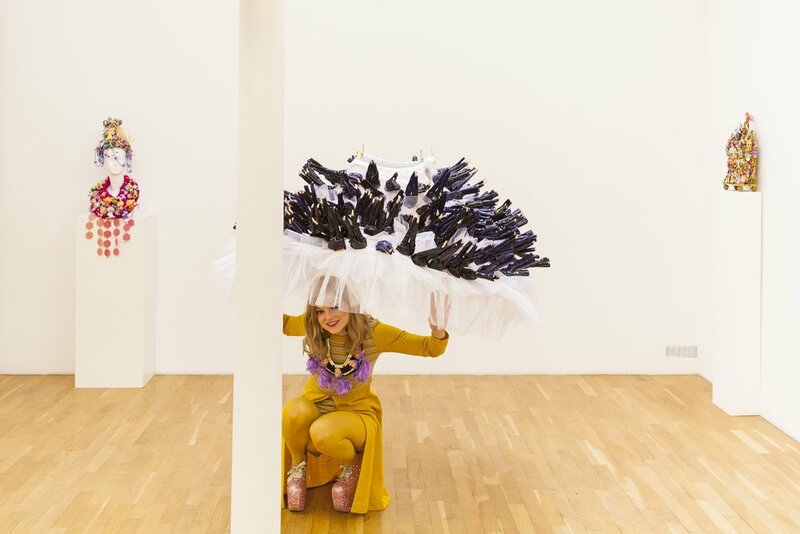 This pieces explore the issue of feminism and the status of woman's body in a postmodern society through an interactive costume-based performance. The performance questions feminism paradoxes, taking more side of an "hyperfeminization" of the woman body, strong and sensual.